Not many cities can boast 27 percent of cyclists continue using their bikes several times a week all year-round, especially not in cities with eight and half months of winter or an average of 256 days of thermal winter and snow. Oulu, Finland (population 191.000), however, is no ordinary town. It is a town where 98 percent of the cycling network is maintained all winter and all routes have street lighting. Timo Perälä founder of the Winter Cycling Federation and organiser of the first Winter Cycling Congress in 2013 recently gave us the backstory on his hometown; it’s worth retelling here. How did Oulu become a cycling city? In 1969, Oulu started down the same path of auto-centricity many other cities were taking mid-twentieth century. A new traffic plan was created by a New York City engineering firm calling for huge intersections and motorways, but this new plan also sparked a backlash among citizens who valued their ability – and that of their children – to move about safely and easily on foot or by bike. It’s worth noting, this sentiment was similarly felt in the Netherlands, for a great summary of how the Dutch brought back cycling in the 1970s, check out this post from the Bicycle Dutch blog. One result of the backlash was the city created its first bicycling and walking plan in 1972. Perälä said it took about 10 years for it to become normal practice to build infrastructure for cycling and walking. After this initial period, however, it became obvious that biking and walking are equal modes that bring significant planning and traffic management benefits. Furthermore, proper traffic engineering practices eliminate conflict with other modes. Over the past 40 years, the city has created an extensive cycling network, which is separate from the car network. The network covers the whole city so destinations like work and shopping can be reached via comfortable, direct and fast connections from residential areas. Cycling is a part of the transportation system, and infrastructure has mainly been funded through larger traffic projects, though dedicated funding has been available since 1972. The result is an environment safe enough that 50 percent of 13 to 17 year-olds cycle year-round. How is winter cycling being enabled? Good infrastructure also leads to easier maintenance. As the bike network is separate from the car network, it is possible to provide cyclists safe passage without scraping down to bare pavement on every route. Average snow cover in winter is often 30-40 centimetres (12-16 inches) so the solution in Oulu is to pack down the snow and cover it with gravel. Salt is not used at all. “It works beautifully,” Perälä said. 35 percent of winter cyclists use studded tires, but Perälä said in his experience traction on a layer of packed snow is good enough that they are not needed. The only tricky times can be in the spring after the layer of packed snow melts and early winter before the permanent snow cover. Currently, sand is being spread across cycle routes to help combat black ice. Bike routes are prioritized and cleared before peak times at 7:00 a.m. and 4:00 p.m. The cost to maintain 800 kilometres of bicycle and pedestrian routes is €1.5 Million. About 85 percent of that budget is for winter maintenance and the remaining is for small repairs and cleaning during summer. What happens after the basic network is built? Though the infrastructure exists and cycling is a normal practice, car use has continued to increase at the expense of cycling and public transport in Oulu. Mode share for cycling was at 22 percent in 2009, but this is half of what it was in 1962, while mode share for cars had grown to 54 percent in 2009 from 17 percent in 1962. To keep encouraging cycling, which is valued for its health, social and economic benefits, Oulu keeps evolving as a cycling city. Improvements have included creating a car-free city centre, building better street crossings and more. Since 2010, an average of 17 kilometres per year have been added to the network. Addressing winter cycling is part of this process. Perälä got the idea to examine the barriers, motives and health effects of winter cycling about 15 years ago. After sharing the findings of his study around Europe, Japan and Canada, Perälä began to realize winter cycling was quietly booming. An English summary of the study is available here. Maintenance does not interrupt the journey for these winter cyclists in Oulu. Photo from Eltis.org. To keep moving the conversation forward, he organised the first Winter Cycling Congress. Perälä said hosting the congress woke up the city government to the idea that they are doing something good and should continue. Although the city had a number of traffic engineers who specialise in designing cycle paths, Shared Space and traffic calmed streets, there was no one specialising in bicycle promotion. To help sustain the practice of cycling, the city has now hired Perälä as the first Cycling Coordinator. He is creating campaigns aimed at all different target groups, incorporating new technological solutions and understanding cyclist perceptions to increase the quality of the cycling experience. Perälä, like Anders Swanson organiser of Winter Cycling Congress Winnipeg, said he continues to be surprised by the enthusiasm of people all around the world for winter cycling. 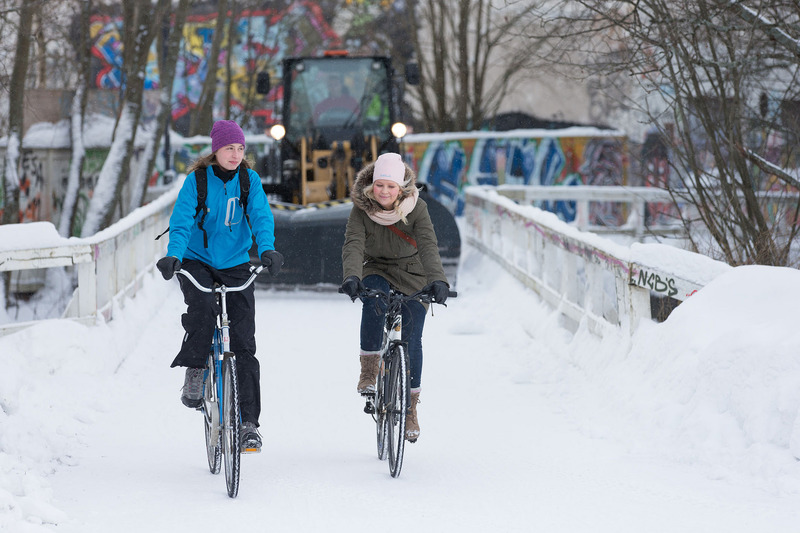 We’re looking forward to hearing more about Oulu at Winter Cycling Congress 2015 Leeuwarden. Don’t delay registering, the early-bird discount is only available through 26 October. I enjoyed the photographs and article, but could you explain what is meant by the first statistic – “27 percent of cyclists continue using their bikes several times a week all year-round” – does this mean that the winter cycling rate is just over a quarter of what it is during the summer? Yes, that is correct. Anecdotally, I have heard retaining 10 percent of cyclists in winter is average. Cities are starting to do more counts in the winter, but right now there isn’t a lot of data in this area. Also, check out the story about Toronto, they used counts to justify funding better winter maintenance of priority cycle routes.